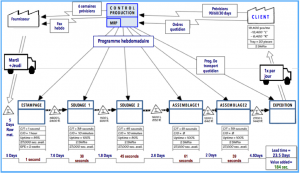 Home / News / Value Stream Mapping (VSM) : Why is it important to use it? A VSM is a tool to map the value stream of a company in the simplest and easiest way. It starts with the customer (input) and ends with the delivery of the final product (output). It represents both information and physical flows and how their evolution. This is called Lead Time. This Lead Time calculation helps identify the Value Added tasks and the Non Value Added tasks. 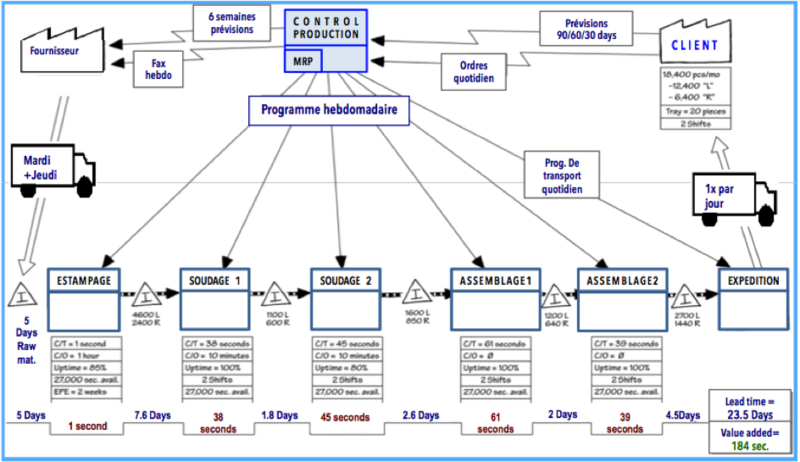 This calculation will provide usefull information to calculate the Process Cycle Efficiency (PCE). The PCE is a statement of the current level of productivity of the company. Then, you will be able to procede to the search for efficiency losses with LSS tools such as SECAR (Simplify, Eliminate , Combine , Automate , Reallocate) 8 Wastes etc … . Thereafter the search for efficiency loss through the table of 8 Wastes gives vision tools / methods applicable to reduce them. Once the solutions found, a new VSM will be established to map the future value chain. Finally, an action or project plan for changes to move from the current state to the future will be proposed . The best way to be sure of success at the time the project is to apply the DMAIC (Define , Measure, Analyse , Improve, Control) . In short, VSM is used to map the different flows and to model the actual and future states of the value stream.